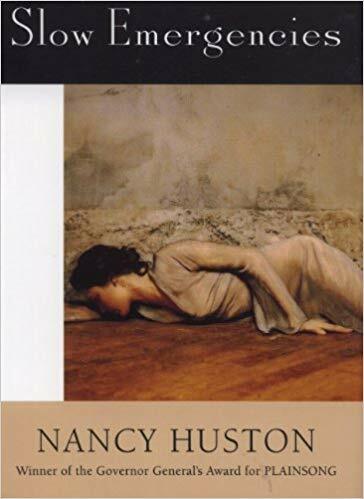 Slow Emergencies / Nancy Huston; translated from the French by Nancy Huston. Toronto: Macarthur & Co., 1996, c1994. Nancy Huston was born in Calgary but has lived in Paris since 1973. She writes most of her novels in French and then translates them herself into English, or vice versa. What a skill to have! This small novel examines the life of a family in New England: professor Derek, dancer/choreographer Lin Lhomond, and their two children Angela and Marina. It describes the joy and pleasure of the marriage, both the physical and emotional enjoyment of one another that Derek and Lin share. And it also reveals the reality of birth and life with first one infant, then two. The heart of the book is Lin's desire to dance, and her utter commitment to the movement of the body. It's when she's dancing that she feels like she is most herself, and her growing domesticity and the fear that having children brings with it alarms her. When she is offered a job directing a dance company in Mexico the year that her children are 3 and 6, she takes it. And never goes back. Derek is left to manage a life alone with his children, though he isn't alone for long. He remarries, while Lin continues travelling, dancing, and creating. The book looks at the effects of this decision on both of them, as well as both of their children. Angela, more sanguine since birth, manages to keep moving forward with her life though she might have some commitment issues. Marina, problematic since infancy, continues to hold on to her difficult relationship with life and search out pain and suffering in any way she can. But the various interactions reveal a life lived despite everything, for each of them. What I really loved about this story was its refusal to blame or judge Lin for her choices. In the end, she feels that it was worth it, that her artistic fulfillment and life as a dancer was the right call for her. And I understand that completely. She's not a 'bad mother', she's a mother and a person who needed something else from her life. And her children are people who have to make their own choices as well, as individuals. There's a lot more to this book despite its brevity. Lin's best friend Rachel plays a big role, Rachel's former lover Sean Farrell (a coworker of Derek's) is key to the story, Lin's family of origin and her mother's own story affect the outcome too. Like Lin's dancing, this story is about movement, the moving target of a 'perfect' life, the continual shifting of family configurations and emotional connections. The structure of the book is quite reflective of this as well - it jumps years, it tells its story in brief glimpses of specific moments, and it relies on Lin's dreams to illuminate part of the emotional content of the narrative. Thankfully, this is done skillfully and meaningfully, not as an "it was all a dream" trope. It's refreshing to read something so unwilling to bend to the cult of domesticity and motherhood as a saintly calling. It feels like each of the characters is doing what they have to do, and making a life around it. While I found parts of it tough going (Marina is a troubled presence throughout) I respected Houston's narrative choices and found that this was a rewarding read. Melwyk, I enjoyed reading your insightful, well-written review. This novel sounds fascinating and thought-provoking. Nancy Huston is an interesting writer - sometimes I love her work and sometimes I really don't like it. She seems to have such different books in her! I found this one pretty fascinating though.